One of the hottest actresses in showbiz industry is Valerie Bangs Garcia but disappear in the limelight when got married. Yesterday December 5, 2017, Bangs gave birth to her very first baby girl at exactly 5:00 am London time. An Instagram user account named Officialbangs posted a few pictures of her and her newborn baby, which she and her husband named Amelia. Infactbuzz learned about Bangs Garcia's giving birth through Kami.com.ph. Bangs was on her 40th week when she gave birth on the Morning, December 5, 2017, in London according to the caption in the uploaded pictures. 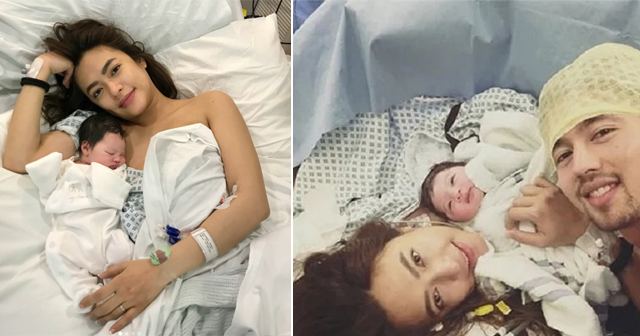 "Today, December 5, 2017 at exactly 5 AM in London, @valeriebangsgarcia has given birth to a bouncing baby girl named Amelia! Congratulations love! Congrats mommy Bangs and daddy Lloydi! From your Team Bangs family! We pray for your fast recovery! We love you so much! ❤️ Thanks for the heads up @kuyamhike God bless! #BangsGarcia" the captioned in the Instagram post. Bangs was a very talented actress who can perform a different role on television. She is also popular with her hot sizzling dance move as she often seen dancing and showing her talent on ASAP stage. Bangs first tv show appearance was seen on 2006 in a youth-oriented sitcom Let's Go where she played an important role as a rocker chic with her face cover with her fringe. Bangs suddenly disappear into Television when she decided to tie the knot with Lloydi Birchmor a Filipino British handsome guy. They tied the knot last January 24, 2017, in Boracay. But before that, they first went to London to have their civil wedding. Let's congratulate bangs and her husband for having a wonderful baby. Share this article.